In this op-ed, President Michael S. Roth writes: “In a year when inducements to political violence have become normalized at the highest level, colleges and universities must do more than just encourage our students to vote.” It is crucial that colleges actively work to protect free expression, free inquiry, and fact-based discussion, Roth argues. Assistant Professor of Psychology Mike Robinson, Samantha Hellberg ’16, and Trinity Russell ’17 are coauthors of a study published in the Journal of Cognitive, Affective, & Behavioral Neuroscience, October 2018. 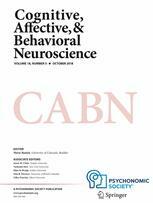 In the paper titled “Cued for risk: Evidence for an incentive sensitization framework to explain the interplay between stress and anxiety, substance abuse, and reward uncertainty in disordered gambling behavior,” the coauthors propose a theoretical framework about how cross-sensitization of reward systems in the brain, in part due to uncertainty, leads to high levels of comorbidity between gambling, substance use, and anxiety disorder. In particular, the coauthors review the literature on how cue attraction and reward uncertainty may underlie gambling pathology, and examine how this framework may advance our understanding of comorbidity with anxiety disorders, and substance use disorders, such as alcohol and nicotine, which are both frequently consumed in gambling settings. Wesleyan faculty frequently publish articles based on their scholarship in The Conversation US, a nonprofit news organization with the tagline, “Academic rigor, journalistic flair.” In a new article, Mike Robinson, assistant professor of psychology, writes that brain science explains how gambling games hook players, including casual ones. Robinson also is assistant professor of neuroscience and behavior, assistant professor of integrative sciences. To call gambling a “game of chance” evokes fun, random luck, and a sense of collective engagement. These playful connotations may be part of why almost 80 percent of American adults gamble at some point in their lifetime. When I ask my psychology students why they think people gamble, the most frequent suggestions are for pleasure, money, or the thrill. While these might be reasons why people gamble initially, psychologists don’t definitely know why, for some, gambling stops being an enjoyable diversion and becomes compulsive. What keeps people playing even when it stops being fun? Why stick with games people know are designed for them to lose? Are some people just more unlucky than the rest of us, or simply worse at calculating the odds? As an addiction researcher for the past 15 years, I look to the brain to understand the hooks that make gambling so compelling. I’ve found that many are intentionally hidden in how the games are designed. And these hooks work on casual casino-goers just as well as they do on problem gamblers. Robinson and his research students will use optogenetics in rats to inhibit parts of the brain’s prefrontal cortex during the decision-making process. The Robinson Lab focuses on the brain mechanisms underlying motivation and reward and how they come together to produce desire and risky decision-making. These findings would be relevant to various forms of addiction such as drug abuse and gambling disorders. Drug and behavioral addictions like gambling are characterized by an intense and focused pursuit of a single reward above other healthier endeavors. Pursuit of the addictive reward is often compulsively sought despite adverse consequences. In a newly published study, Mike Robinson, assistant professor of psychology, neuroscience and behavior, and integrative sciences explored how our decisions can become narrowly focused onto one particular choice. He and his research team used laser light (optogenetics) to activate the central portion of the brain’s amygdala (CeA), an area normally known for its role in generating responses to drug-related and fearful stimuli. The study, titled “Optogenetic Activation of the Central Amygdala Generates Addiction-like Preference for Reward,” appears in the May 2018 issue of the European Journal of Neuroscience. Robinson Lab members Rebecca Tom ’16, MA ’17, Aarit Ahuja ’16, Hannah Maniates ’16, and current graduate student Charlotte Freeland coauthored the article and participated in the study. Writing in The Conversation, Assistant Professor of Psychology Mike Robinson looks to the brain to explain the real reason that some people become addicted to drugs. Robinson, who also is assistant professor of neuroscience and behavior, assistant professor of integrative sciences, begins by debunking two popular explanations for drug addiction: that compulsive drug use is simply a “bad habit,” and that overcoming the unpleasant withdrawal symptoms is too hard for some addicts. 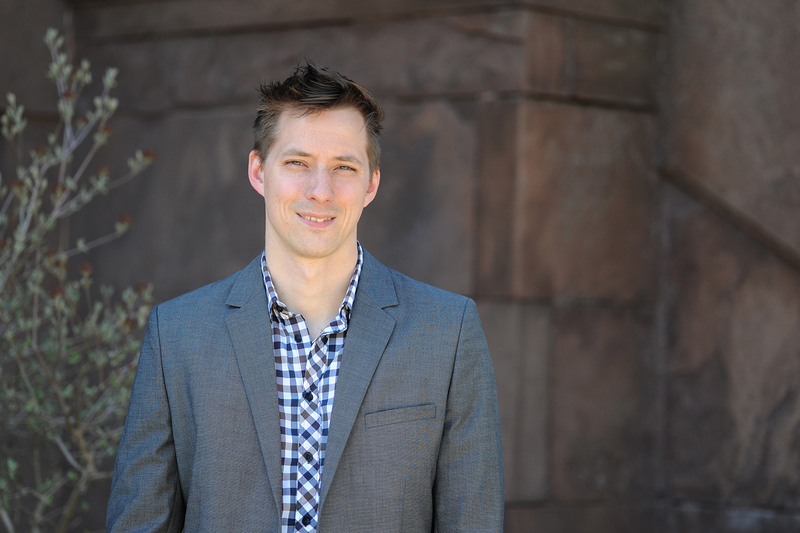 Mike Robinson, assistant professor of psychology, is a co-author of a paper titled “The impact of junk-food diet during development on ‘wanting’ and ‘liking’.” The paper was recently published in The Behavioral Brain Research Journal. His co-authors include Wesleyan alumni Ellen Nacha Lesser ’15, Aime Arroyo-Ramirez ‘16, and Sarah Jingyi Mi ’16. The research looked at the developmental impacts of a chronic junk-food diet throughout development and how it blunts pleasure and affects motivation. The study found that chronic exposure to a junk-food diet resulted in large individual differences in weight gain (gainers and non-gainers) despite resulting in stunted growth as compared to chow-fed controls. Behaviorally, junk food exposure attenuated conditioned approach (autoshaping) in females, particularly in non-gainers. In contrast, junk-food exposed rats that gained the most weight were willing to work harder for access to a food cue (conditioned reinforcement), and were more attracted to a junk-food context (conditioned place preference) than non-gainers. Breaking news: You may be a pizza-holic. Mike Robinson, professor of psychology, professor of neuroscience and behavior, was called on by CNN to comment on a new study examining which foods can be the most addictive. Topping the list: pizza, French fries, chocolate, chips, cookies, ice cream, cake, soda, bacon and cheese. Although not all foods have the potential to be addictive, “it is critical to understand which ones do,” said Robinson, who was not involved in the study, told CNN. “We are all pressed for time, and food is becoming more and more available,” but we need to think about what we are grabbing on the go, he said. Although a handful of almonds and a milkshake might have the same number of calories, they will have a different effects on your brain and your reward system, and you will be much more likely to go back to get more of the milkshake, he added. Many of the symptoms of food addiction look like drug addiction, including that people need more and more of the food item to get the same effect. They also accept negative consequences to obtain it and feel the anxiety or agitation of withdrawal when they can’t have it. Although food withdrawal is not as intense as heroin withdrawal, neither is cocaine withdrawal. “It varies by the drug,” Robinson said. Just like any addiction, the first step to recovery is to acknowledge there is a problem, Robinson said. “I think in the majority of cases when we have a problem with a substance, whether it’s a food or drug…we will ignore it,” he said. Robinson suggests avoiding foods if you have trouble controlling how much of them you eat. “We are not in a situation where we will have dietary deficiencies (and) whenever possible we should be aiming to cook foods for ourselves,” he said. Mike Robinson, assistant professor of psychology, assistant professor of neuroscience and behavior, is the author of an article published Sept. 27 in Current Topics in Behavioral Neuroscience. Titled, “Roles of ‘Wanting’ and ‘Liking’ in Motivating Behavior: Gambling, Food, and Drug Addictions,” the article is co-authored by Adam Fischer, previously Robinson’s lab manager, Aarit Ahuja ’16, Hannah Maniates ’16, and Ellen Lesser ’15. In this paper, the authors argue that two separate but interconnected subcortical and unconscious processes direct motivation: “wanting” and “liking.” These two processes work together but can become disassociated, especially in cases of addiction. For example, in drug addiction, repeated consumption of drugs sensitizes the mesolimbic dopamine system–the primary component of the “wanting” system–resulting in excessive “wanting” for drugs and their cues. This long-lasting change occurs independently of the “liking” system, which typically remains unchanged or may develop a blunted pleasure response to the drug. This results in excessive drug-taking despite minimal pleasure and intense cue-triggered craving that may promote relapse long after detoxification. The authors describe the roles of “wanting” and “liking” in general motivation and review recent evidence for a dissociation of “liking” and “wanting” in drug addiction, known as the incentive sensitization theory. They also make the case that sensitization of the “wanting” system and the resulting dissociation of “liking” and “wanting” occurs in both gambling disorder and food addiction. 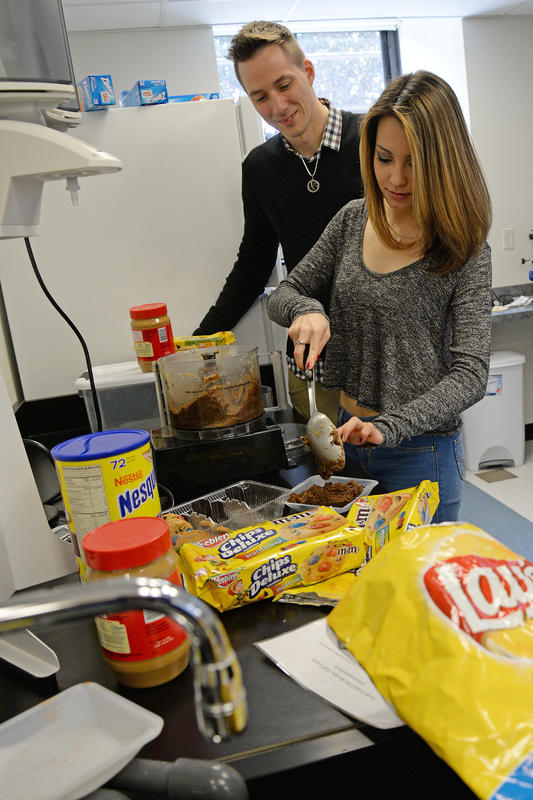 Mike Robinson, assistant professor of psychology, assistant professor of neuroscience and behavior, and his students are interested in what makes individuals react differently when they catch a whiff of freshly-baked brownies or another sugary treat. 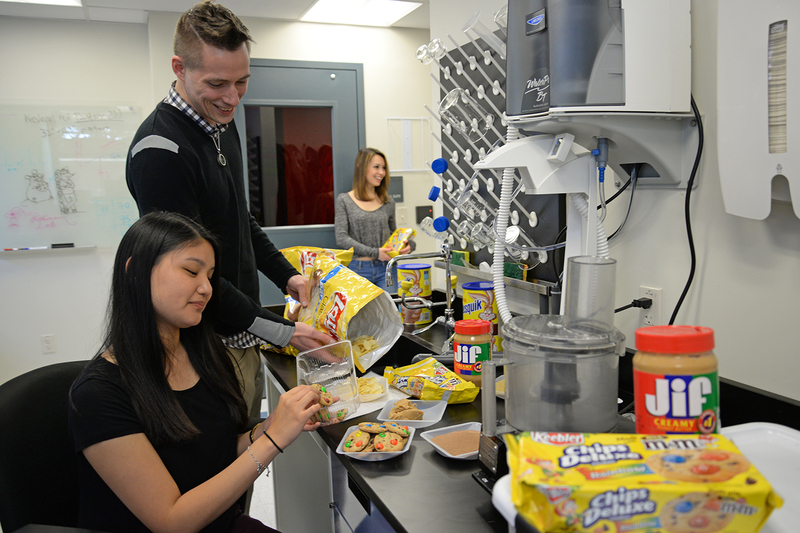 Mike Robinson and Rebecca Tom ’16 remove the junk food concoction from the food processor. These Pavlovian cues associated with junk food can trigger cravings to eat and increase the amount of food consumed. People who are more susceptible to the motivational effects of these cues may have a higher risk for over consuming readily available junk food and becoming obese. Furthermore, the overconsumption of junk food may itself heighten attraction to food cues. But what causes some people to be more susceptible than others? Robinson, together with colleagues at the University of Michigan, explores these issues in an article titled “Individual Differences in Cue-Induced Motivation and Striatal Systems in Rats Susceptible to Diet-Induced Obesity,” published in the March 12 edition of Neuropsychopharmacology. Read the abstract here. The researchers introduced a junk food diet (a mash of potato chips, chocolate chip cookies, peanut butter, and chocolate milk powder) to rats to study whether there were pre-existing and/or diet-induced increases in attraction to cues for junk food, and motivation to seek out the food. They found that prior to gaining weight, the rats that would go on to become obese with the junk food diet showed a greater attraction to food cues. After being exposed to the junk food diet and gaining excessive amounts of weight, those rats began treating food cues as a reward in of themselves, and were more willing to work to obtain them. Mike Robinson recently published an article in the Journal of Neuroscience about the center of the brain that triggers addiction. Having trouble resisting another glass of wine or a decadent slice of chocolate cake? In a new study, Mike Robinson, assistant professor of psychology, assistant professor of neuroscience and behavior, pinpoints the part of the brain that triggers addiction. It’s in the brain’s amygdala, an almond-shaped mass that processes emotions, reports the news site Medical Xpress. These findings were published Dec. 10 in the Journal of Neuroscience (read the full story here). 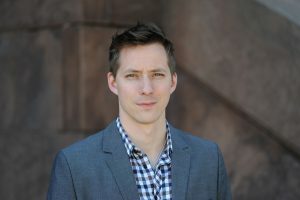 Robinson is the lead author, and co-wrote the paper with two colleagues from the University of Michigan. The study was done using a technique called optogenetics with rats. Whenever the rats pressed a lever to earn a sugary treat, a laser light painlessly activated the amygdala in their brains for a few seconds, making neurons in it fire more excitedly. When the rats pressed a separate lever to earn a treat, their amygdala was not activated. When the rats were then faced with a choice over which lever to press, they focused exclusively on getting the reward that previously excited their amygdala and ignored the other. They were also willing to work much harder to earn the first reward. Robinson told Medical XPress that the results suggest a role for the amygdala in generating focused and almost exclusive desire as seen in addiction. “Understanding the pathways involved in addictive-like behavior could provide new therapeutic avenues for treating addiction and other compulsive disorders,” he said. In this issue of The Wesleyan Connection, we speak with Mike Robinson, assistant professor of psychology, assistant professor of neuroscience and behavior, who joined the faculty in January. Q: Welcome to Wesleyan, Professor Robinson! Please fill us in on your life up to now. A: I was born and grew up in France, in the west suburbs of Paris, but my parents are both British, so that makes me bi-national and bilingual. I went to high school in France and decided to go to university to study neuroscience at the University of Sussex in the U.K. Then I went to McGill University in Montreal, Canada to do a master’s and a Ph.D. in experimental psychology. From there, I went to the University of Michigan for a post-doc before coming to Wesleyan. So I’ve almost jumped a country per position. Q: What brought you to Wesleyan? A: I was attracted by the balance Wesleyan offers—both the work-life balance, and the work balance between the amount of research and the amount of teaching. I really enjoy both teaching and research, but I always felt like I’d have to compromise one or the other if I went to a research institution or a more teaching-intensive small liberal arts school. I feel like Wesleyan has the perfect balance. Plus the opportunity to be with really high-quality students, which I thought would be really stimulating and almost like working with grad students. I currently have four students in my lab, and so far I’ve been very impressed by them. Q: What classes are you teaching this semester? A: I’m teaching one course called “Motivation and Reward.” In the fall, I’ll be co-teaching “Intro to Neurobiology” with Jan Naegele (professor of biology, professor of neuroscience and behavior, director of the Center for Faculty Development), and a research methods course on research in animal behavior. Next spring, I’ll be teaching “Motivation and Reward” again, and an advanced research course looking at where a lot of my research is focused, which is gambling, diet-induced obesity and drug addiction. Q: Please tell us more about your research interests. A: I’m interested in understanding how the brain works. I’ve always wanted to do something that helps people in as direct a way as possible, considering I’m not doing human research. I started out doing research on drug addiction. My Ph.D. work looked at the ability that we may have to affect memory after it’s been created and consolidated, either strengthening or weakening it.